Posted on June 10, 2015 at 1:55 pm. Throughout June, AllSlots.com is giving registered players the chance to claim a share of $150,000 in casino bonuses, free spins and loyalty points. It couldn’t be easier to be in the running; all you need to do is play your favourite casino games in order to open treasure chests and reveal the prizes that lie inside. The more games you play, the more chests you get to open, so you’ll be given the key to either one, two or three chests depending how much you have played within each promotional round. If you meet these requirements, to claim your prize click on the ‘Pharaoh’s Treasure’ promotion banner on the All Slots home page. Enter your user name and select ‘unlock my treasure.’ You’ll then have permission to open your earned treasure chests to reveal the prizes inside, with winnings automatically credited to your account. Make sure to open the treasure chest within the designated promotional period otherwise you’ll risk forfeiting your winnings. Free spins can be played on Avalon, Golden Princess and Terminator II only, with each game available on desktop and mobile, however if using your mobile, free spins will only apply to Avalon. 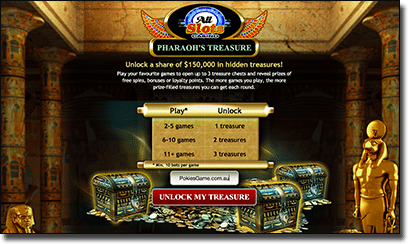 Make sure to check the terms and conditions of the Pharaoh’s Treasure promo to avoid any confusion. Not yet a registered player at All Slots Casino? Sign up now to receive a $300 welcome bonus and make a deposit in June for your chance to reveal the hidden treasure.